2 or more: $28.12 ea. 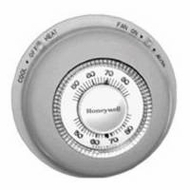 The Honeywell YCT87 The Round model offers the classic circular thermostat design that so many of today’s homeowners prefer over stark, digital models. This timeless look is a great fit for any home, making the Honeywell YCT87 The Round manual thermostat an excellent home climate control solution. Find out just how reliable Honeywell’s YCT87 The Round model really is by ordering yours from Today’s Concept.